The days of searching for the perfect power solution are gone. Simple, unique and innovative, MPS pop up power points are changing the way we access power as we know it. Power devices simultaneously and conveniently with UK standard power points and USB charging ports capable of charging any USB charging devices. Featuring a unique and functional design, available in an array of colour options, the V5 range is sure to set your space apart. When designing our homes and offices, we are faced with decisions about the smallest of details as indeed it is the trifling aspects of modern spaces that set them apart. When it comes to deciding on electrical fittings however, most people don’t look any further than the white plastic plug assuming that’s their only option. That’s why MPS pop up power points are revolutionising the way we access power in our kitchens, offices and other spaces. The days of searching for the perfect power solution are gone. Charge multiple devices simultaneously, quickly, simply and neatly with the convenient Australian power points. Featuring a unique and vibrant design the MPS “V5” model is a world first. Featuring a revolutionary design that allows the unit to become fully waterproof when it is flush with your bench top, The “V5” is perfect for kitchens and takes the worry out of spills. The MPS “V5” is sure to set your space apart. Water Resistiveness: Only when in the closed position. Installation: The MPS V5 Pop Up Power Point is simple to install. A hole with a diameter of 82mm is required in the desired installation surface. 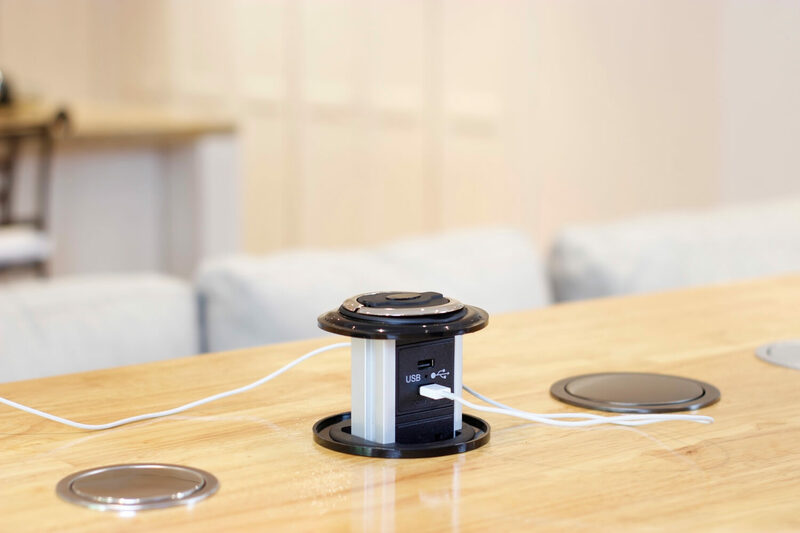 The unit can then be fitted to the hole and plugged into a standard power point underneath the bench top surface. The unit is then ready for immediate use – No professional help required! Returns are accepted within 14 days of receiving your order. Buyer must pay for the return postage costs if they decide to return their order based on “change of mind” reasons. If the purchased product is deemed faulty, the buyer will be reimbursed for any return postage cost. A full refund on the order will be provided if the whole order is returned within the 14 day period. 1.1. Please read the following Terms and Conditions carefully before placing your order. These Terms and Conditions contain important information about the ordering, processing, fulfilment and delivery of goods, including limitations of liability. 1.3. By browsing the website, or placing an order, you agree to these Terms and Conditions as set out below, which constitutes a legally binding agreement between us and you for the supply of products. 1.4. The agreement together with your order constitutes the entire agreement between us and you for the supply of Products. The agreement cannot be varied unless we agree to vary it in writing or by email. 1.5. You must take your own precautions to ensure that your process for accessing the website does not expose you to risk of viruses, malicious computer code or other forms of interference which may damage your computer system. We take no responsibility for any such damage, which may arise in connection with your use of the Website. 1.6. Orders will be deemed to have been received by Modern Power Solutions PTY LTD at the time Modern Power Solutions PTY LTD sends an order confirmation to your nominated e-mail address. 1.7. MPS PTY LTD reserves the right to decline to enter into a purchase contract with you and may cancel your order at any time prior to dispatch of the product(s). 2.1 All refunds may take up to 10 business days to be processed. 2.4. For the avoidance of doubt, nothing in this clause limits or restricts your ability to make a claim that may be available to you for our failure to comply with a guarantee under the UK Consumer Law. 3.2. Stock is limited and may become unavailable at short notice, despite being displayed online otherwise. However, if you do purchase a product that has an expected handing-time delay beyond 3 days, you will be notified via email, and offered a full refund. You may also choose to be notified when the product becomes available again. 3.3. Modern Power Solutions PTY LTD uses Third Party Logistics companies and postal services including (but not limited to) UK Post, Toll Express, DHL, FEDEX and Couriers Please. This makes it often difficult to maintain consistency in postal times. However it is expected that you receive your product within 3-5 days of ordering, unless otherwise specified, such as Express postage options or 24hour RUSH. 3.4. If your product has been damaged in transit, we will review the damage with the courier providing the complain is genuine, we will then provide you with a brand new replacement after the product has been returned to us, The return postage cost of the product is levied onto the customer in this instance. 3.5. Tracking information is always available, however not often provided to the customer. If you would like tracking information, please request it after you have placed your order and one will be provided along with the courier services used to deliver your item. 3.6. Pickup is only available for larger orders for certain products, and contact must be made prior to purchase, to organise suitable times between the customer and our warehouse. 3.7. Currently we accept payment in the form of Bank Deposit, Cheque, Cash on Pickup (limited availability) and PayPal. However for orders over $1000, a 2% credit fee may apply to purchases paid via credit card [PayPal]. 3.8. International shipping costs may apply, please contact us first to confirm correct cost, and postage times, this will vary depending on the size and value of your order. 3.9 We are here to help; feel free to contact us at any time either via phone, email or text. We provide Sales support throughout every purchase experience to all our customers free of charge, with an average email response time under 24 hours. 4.1. Products sold by our business must be used at your own risk. For our electrical products these risks include fire, electrical shock in extreme circumstances, death. 4.2. All Modern Power Solutions PTY LTD electrical sockets cannot be used on circuits without sufficient RCD protection, Failure to follow such instructions voids warranty and liability completely. 4.3. We appreciate customer feedback, please feel free to share with us your opinion on our quality of product and service. 4.4. After purchase, your provided email address will automatically be added to the Modern Power Solutions PTY LTD mailing list. You can unsubscribe at any time. 5.1.1. A change-of-mind return fee of 5.6% applies to customers. 5.1.2. Full refunds will be provided to faulty items, however generally we test and report all products in orders over $1000 to ensure they are in working condition. If we test and provide a working certificate, and you still receive a faulty product, then the fault is brought upon the courier company, and a higher 8.9% refund fee applies. 5.3. For orders with a handling time of 10 days or more, customers may choose to pay 50% of the total invoice amount at the time of order, and the further 50% 2 days before the product is received. Business address details must be provided including client contact details and ABN information in such instances. £59.95 VAT Inclusive Buy Now! £29.95 VAT Inclusive Buy Now! £32.95 VAT Inclusive Buy Now! £149.95 VAT Inclusive Buy Now!